Antoni Gaudí is often considered the master of Catalan Modernism. Here, some of his most remarkable works in Barcelona speak of his inspiration in nature and passion for geometric forms. Antoni Gaudí i Cornet was born in Tarragona in 1852. In his early years, he spent many hours observing nature. As an architectural student, he did not shine, but exceeded himself with genius ideas. Nature was Antoni Gaudí main teacher and supreme source of inspiration. He took inspiration from nature to shape all of his works. Gaudí wanted to discover the essence of Mother Earth and pass the essence onto his creations. Gaudí's main sponsor was Eusebi Güell, who remarkably managed to push the industry at a national level and began a relationship of mutual admiration with Antoni Gaudí. He reached professional success with the Church of Colonia Güell, Casa Batlló, Casa Mila (also known as La Pedrera), Park Güell, and Sagrada Familia. At the same time he was reaching professional splendour the Catalan architect began his personal withdrawal gradually staying away from his social life and beginning a period of more mystical and religious life, which coincide with his work in his unfinished Sagrada Familia. In 1926, Antoni Gaudí was hit by a tram and died a few later. He was buried in the Sagrada Familia where his tomb can be visited. In his Catalan Modernism style of architecture, Antoni Gaudí's works show his search for perfection in art, perfection in humanity, and perfection in society. Some of Antoni Gaudí's most famous and most visited buildings in Barcelona include La Sagrada Familia, Park Güell, Casa Batlló, Casa Mila, and Casa Calvet. Casa Batlló is a beautiful piece of architecture inspired by nature. A world Heritage Site by UNESCO. The original house was built between 1875 and 1877. In 1900, Josep Batlló purchased the house and in 1904 he commissioned the renovation works to Gaudí who completed it in 1906. Gaudí expanded the interior court, change the fronts of the street and of the interior, crowned the building with a new cover, and changed the floors. Casa Batlló is a pictorial composition, brilliant with the Mediterranean light. Casa Batlló is the only example in the world whose strong symbolism and character creates a magical tale beyond Modernism, poetry, and art. The broken glass and the glazed ceramics from Paseo de Gracia make the iconic facade a welcoming interior. Since 1993, Casa Batlló has been managed by its current owners. The house rents its facilities for events. Casa Batlló receives one million visitors annually. Eusebi Güell gave Gaudí the assignment of drawing up plans for developing an estate for well-off families on a large property he had acquired in the zone known popularly as the Muntanya Pelada (bare mountain). Park Güell began to be built in 1900 and it was completed in 1914. Antoni Gaudí himself moved there in 1906 to live with his father and niece. His house in Park Güell was opened to the public as Gaudí House Museum in 1963. Park Güell became a public park much appreciated by Barcelona’s inhabitants, as well as a major focus of attraction for visitors. Park Güell was recognised as an artistic monument in 1969 and declared a UNESCO World Heritage Site in 1984. Casa Milà was the last private residence designed by Antoni Gaudí. It is the most iconic work of civic architecture due to both its constructional and functional innovations, as well as its ornamental and decorative solutions. However, the building was controversial because of its undulating stone façade and twisting wrought iron balconies. In 1984, it was declared a World Heritage Site by UNESCO. From 2013 is the headquarters of the Fundació Catalunya which manages the visit to the building, exhibitions, and other cultural and educative activities at Casa Milà. The construction of La Sagrada Familia began in 1882. Currently, 70 percent of the Basilica de la Sagrada Familia (the Basilica of the Holly Family) is completed, with a set date to be finished by 2026. The image above is from 2017. Antoni Gaudí was in full knowledge of the fact that he would not see the temple finished. He decided to plan the construction of the Sagrada Familia in modules. Gaudí started with the apse and the Nativity façade with the idea that if he managed to leave at least one of them finished, it would be more difficult to abandon the construction. And that's the only part of the Sagrada Familia orginally built by Antoni Gaudí. In order to overcome the defects he saw in Gothic structural systems, Gaudí aimed to create a new architecture with balanced and self-supporting structures. Antoni Gaudí took his inspiration for the Sagrada Familia from two sources: the Christian message and nature. Gaudí's long life observation of the natural world always provided him with a conceptual and methodological framework present in all of his works. Gaudí did not just copy nature but analyzed the function of its elements to formulate structural and formal designs which he then was able to apply to architecture. Casa Calvet is one of Antoni Gaudí's earliest works. It has been considered the architect's most conservative construction. Although it also contains marked modernist elements such as the façade which terminates in a curve and the attic balconies which look like something that came out from a fairy tale. The ground floor presently houses a restaurant. Casa Calvet was commissioned by the textile manufacturer Pere Màrtir Calvet who set up his business premises on the ground floor and in the basement, and used the upper floors as his private residence. In 1900, Barcelona City COuncil awarded Casa Calvet the prize for the best building on the year. 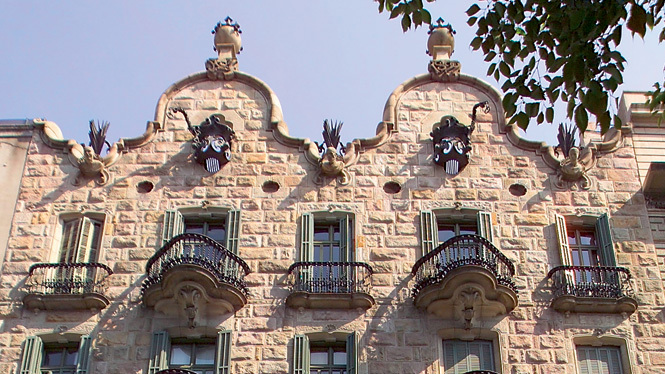 Casa Calvat was built in baroque Catalan style using stone quarried on Montjuic. The house features splendid wrought ironwork on the balconies. Both the hall and ground floor are particularly interesting. There, the typical Catalan ceiling, granite Salomonic columns, and arches with their vine-shaped reliefs are a reminder of Gaudí's attention to the detail.